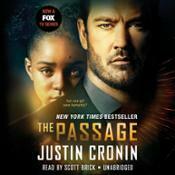 The Passage, by Justin Cronin, read by Scott Brick, Adenrele Ojo, Abby Craden. Unabridged (36 hrs, 52 min) Random House Audio, 2010. "It happened fast. Thirty-two minutes for one world to die, another to be born. "First, the unthinkable: a security breach at a secret U.S. government facility unleashes the monstrous product of a chilling military experiment. Then, the unspeakable: a night of chaos and carnage gives way to sunrise on a nation, and ultimately a world, forever altered. All that remains for the stunned survivors is the long fight ahead and a future ruled by fear - of darkness, of death, of a fate far worse. READ REVIEW at Audiobook Fans.